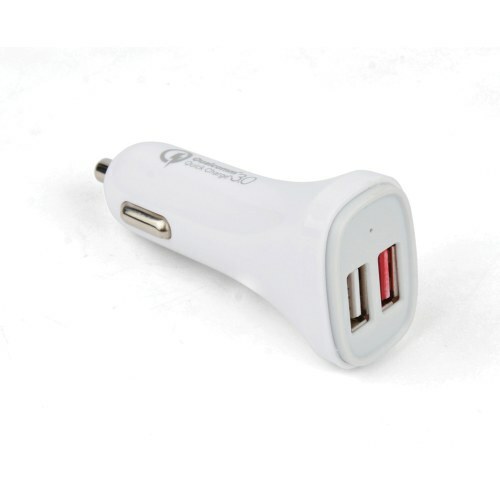 This product is a high-performance car charger equipped with two output ports, one supports 5V/2.4A smart charging, and another is compliant with Qualcomm® Quick Charger™ 3.0 technology. With this car charger, it is feasible for you to charge any devices (eg: digital cameras, PDAs, mobile phones, USB accessories) with your car when it is in necessity, and two devices can be charged at the same time.It is helpful and convenient for you in long time journey and for business! Allows the 12 -24VDC of input voltage. USB1: 5V/2.4A, with intelligent IC detecting output requirements of your device automatically. Compliant with Quick Charge 3.0, charging speed is four times faster than normal charger. Accurate limited current output and over current protection. Over load protection and short circuit protection. Over temperature protection with auto-Recovery. Select precision electrical components, fire line version, and imported fire plastic.